Tony Gwynn Jr. says he wasn’t healthy during his final two years with the Dodgers. Philadelphia Phillies outfielder Tony Gwynn Jr. doesn’t regret his situation. He’s back in the major leagues after a year-and-a-half layoff. Monday, he was batting leadoff at Dodger Stadium. For the season, he’s batting .250 and is a regular in the Phillies’ outfield rotation. If he could do anything over from the last two years, however, he admitted that he should have had surgery early in 2012. That’s when Gwynn first noticed the symptoms the led to his sports hernia surgery in September of last year. The symptoms persisted throughout the 2012 and 2013 seasons. 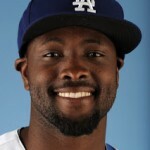 After a hot start to the 2012 season, Gwynn found himself back in Triple-A for good by August. He didn’t make the major-league roster out of spring training in 2013. Gwynn batted .300 for the Albuquerque Isotopes last year, his first full minor-league season since 2008. It wasn’t how he or the Dodgers envisioned the season playing out after Gwynn signed a two-year, $2 million contract in December 2011. One thing Gwynn wanted to make clear: The injury is no excuse for his performance at the plate. It only affected him when he ran, albeit severely. “I had no explosion,” he said. Gwynn’s shortcomings at the plate — he batted .232 in 2012 before his demotion — were on him. Gwynn said that Albuquerque manager Lorenzo Bundy, now the Dodgers’ third-base coach, was integral to his turnaround at the plate. More from Gwynn and Bundy in tomorrow’s editions. This entry was posted in JP on the Dodgers and tagged Albuquerque, Lorenzo Bundy, Philadelphia, Phillies, Tony Gwynn Jr. by J.P. Hoornstra. Bookmark the permalink.